This plate was designed by Joseph-Theodore Deck, who worked at Sèvres as a designer before eventually becoming director in 1887 until his death in 1891. Prior to becoming director, Deck was part of the Council of Improvement and helped to establish aesthetic and technical directives for the manufactory at the end of the nineteenth century. This plate was influenced by past sources of design and earlier technological advances at Sèvres, as well as those developed during Deck’s tenure at the manufactory. The director Henri-Victor Regnault, a physicist and chemist, whom Deck would have designed for, had Sèvres focus on technological achievements in their production, rather than artistic ones during his time as director. This led to the development of high-fired colors and colored pastes. During Deck’s time at Sèvres, another chemist, Alphonse-Louis Salvetat developed ways of emulating enamel effects. 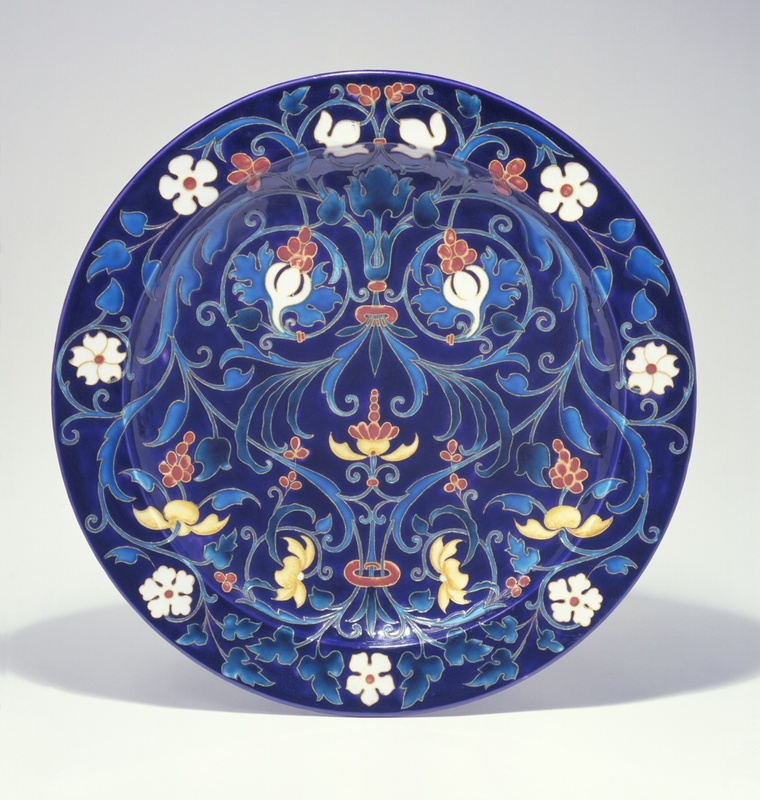 This had been explored earlier in the middle of the nineteenth century, when Sèvres porcelains began to use features of other media in their decoration, such as trying to emulate Limoges enamels, but Salvetat brought the technique further. The bright colors and champlevé enamel appearance of this plate are a result of the experimentation with types of porcelain and glazes done during Deck’s time at Sèvres. The flat curved floral design of this plate was in accordance with the Council’s recommendations not to use perspective in decoration and that decoration should respect form, which the curved patterning on this plate does. Overall, this plate reflects the changes in porcelain manufacture and glazing that took place at Sèvres while Deck was watching. Audrey Sutton is a graduate student in the History of Design and Curatorial Studies program at the Cooper Hewitt, Smithsonian Design Museum.